IRS Form W-4P, "Withholding Certificate For Pension Or Annuity Payments" is a tax form issued by the United States Internal Revenue Service. The latest version of the form was released in January 1, 2018. A up-to-date fillable W-4P Form in PDF is available for download below. The "Withholding Certificate For Pension Or Annuity Payments" can be filed digitally and submitted online or printed out and sent to the IRS mailing address. enacted after it was published, go to www.irs.gov/FormW4P. amount of federal income tax to withhold from your payment(s). to have an additional amount of tax withheld. effect if you don’t file a Form W‐4P for 2018.
income from wages, see Pub. 505 or use the calculator at www. on Form W‐4 or Form W‐4P. Sign this form. Form W‐4P is not valid unless you sign it. spouse, or a large amount of income outside of your pensions. don’t need to complete any of the worksheets for Form W‐4P. States and payments to foreign persons. Separate here and give Form W-4P to the payer of your pension or annuity. Keep the worksheet(s) for your records. Complete the following applicable lines. you whether Form W-4P applies. security number” on Form W-4P. (if permitted) or to change your choice. 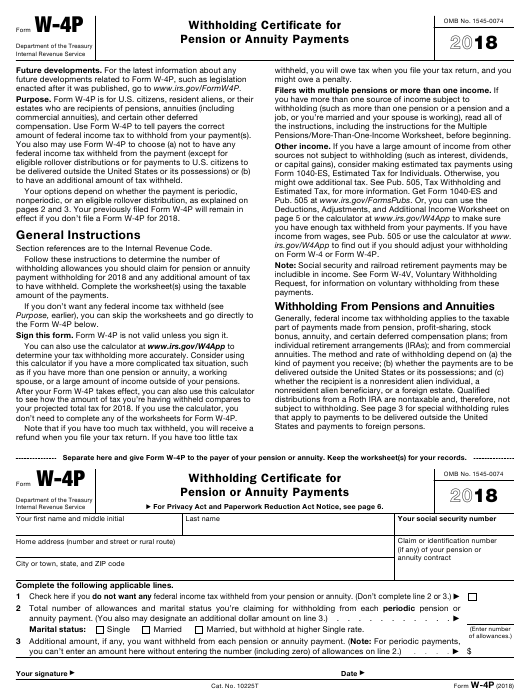 your pension or annuity using Form W-4P. Payments To Be Delivered Outside the United States on page 3.
paid annually, quarterly, monthly, etc. specify an additional amount that you want withheld. to be withheld on line 3. United States on page 3.
annuity is at least $1,990 a month. number of withholding allowances to claim. subject to the mandatory 20% federal income tax withholding. Pub. 501 for more information about filing status. including income earned by a spouse, during the year. rate, complete line 2 on the form. Form W-4P to your payer. your withholding to take these credits into account. your withholding if you don’t wish to do so. plans are exempt from withholding even if no tax treaty applies. the foreign person’s taxpayer identification number (TIN). to complete any of the worksheets for Form W‐4P. tax return and might be subject to a penalty. and 3 of his or her Form W‐4P. See Pub. 505 for details. to figure your withholding more precisely. A Enter “1” for yourself . C Enter “1” if you will file as head of household . wages (or the total of all) are $1,500 or less. E Child tax credit. See Pub. 972, Child Tax Credit, for more information. • If your total income will be less than $69,801 ($101,401 if married filing jointly), enter “4” for each eligible child. • If your total income will be higher than $200,000 ($400,000 if married filing jointly), enter “-0-” . F Credit for other dependents. “2” if you have four dependents). • If your total income will be higher than $175,550 ($339,000 if married filing jointly), enter “-0-” . withholding, see the Deductions, Adjustments, and Additional Income Worksheet, later. 2 of Form W-4P above. of your income. See Pub. 505 for details . 3 Subtract line 2 from line 1. If zero or less, enter “-0-” . blindness (see Pub. 505 for information about these items) . 6 Enter an estimate of your 2018 other income (such as dividends, interest, or capital gains) . 9 Enter the number from the Personal Allowances Worksheet, line H, page 4 .
than one pension, or a pension and a job, or you have a pension and your spouse works). 2 Find the number in Table 1 below that applies to the LOWEST paying pension or job and enter it here. withholding amount necessary to avoid a year-end tax bill. 4 Enter the number from line 2 of this worksheet . 5 Enter the number from line 1 of this worksheet . 6 Subtract line 5 from line 4 . 8 Multiply line 7 by line 6 and enter the result here. This is the additional annual withholding needed .